There’s an intriguing discussion taking place over at the minidisco forums about the Zoom H2. While many folks have forgotten that minidisc recorders exist, they’re still pretty handy if you’re looking for high quality audio recorders in a tiny package. They have low-cost removable media, and the newer models let you digitally transfer audio from discs to your PC. For the most part, flash and hard drive recorders are still bigger, clunkier, and more expensive than minidiscs. So the Zoom H2 is a pretty attractive piece of equipment for minidisc enthusiasts. It’s small, has a high quality internal microphone, records to WAV or MP3, and costs just $200. While one minidisco forum reviewer says it doesn’t live up to the MZ-RH1 minidisc, the Zoom H2 comes about as close as any flash recorder on the market to being a replacement for a good minidisc recorder. And you can move files from the recorder to your PC without any file conversion. But as we’ve previously learned, the preamps are a bit noisy, making it difficult to use an external microphone. And the internal mic does pick up a bit of extra noise if you pump the gain up to high. However, another reviewer, photographer Skip Hunt has posted a few sample recordings showing that the H2 can sound pretty good if you use the internal mic at the mid-gain setting, or if you use a decent condenser mic like the Sennheiser ME66 shotgun. To my ear, his first two recordings sound the best, while the latter two I could live without. For the most part, they all sound a lot cleaner than the C. C. Chapman sample. But Hunt also obviously took more time to set up the recordings in a quiet environment after configuring various settings on the recorder. What’s interesting is that the ME66 on the mid-gain setting sounds better than the internal mic. 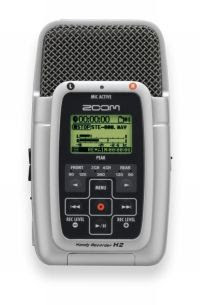 On my Zoom H4, I’ve found that some external mics give a better tone than the internal mics, but they all generate so much hiss that I’d rather not use them. That doesn’t appear to be true with the ME66 and the H2. I’m not sure if that means I should hold out hope for a good mic for the H4 or if I should think about picking up an H2. Yeah, I think I was too hot on the second two recordings. I’m just getting this thing dialed in and when I made those recordings I was just testing still. I have to add also that on the Sennheiser recordings, I’m using a Shure line-matching-transformer with a mono plug inbetween the mic and H2, and the H2 set for mono mix. I went to a music store yesterday and compared recordings done with a standard XLR to 1/8th stereo plug. There was a significant difference. First of all the efficiency with the transformer went up about 7 level clicks. Second, the mic sounded brighter and crisper with the transformer as opposed to the standard XLR to 1/8th Mogami cable. The recording was good with the standard Mogami, but there was a noticable improvement using the transformer. I’m *thiiis close* to buying an H2, but my purpose is recording live music. I want to set it up for recording my own shows, rehearsals, and open jams. I’ve been hunting around for people who have used the H2 for this, and all I’ve found are podcasters and such. Does it handle high volume well? The Zoom H2 like the Zoom H4 has several mic settings, low, medium, and high. You can also tweak the input volumes a bit using the menus, but it’s not quite as useful as having a recorder with a full fledged volume dial. I believe there’s also an automatic gain control setting, so if you plan to record something loud like a band practice or performance, you can set the AGC level in advance. Hi, i have H4N and Rode NTG3, i can't get sound from this shotgun, what settings and mode should i use? the phantom power is on. The Zoom H2 like the Zoom H4 has several mic settings, low, medium, and high. You can also tweak the input volumes a bit using the menus, but it's not quite as useful as having a recorder with a full fledged volume dial. I believe there's also an automatic gain control setting, so if you plan to record something loud like a band practice or performance, you can set the AGC level in advance.